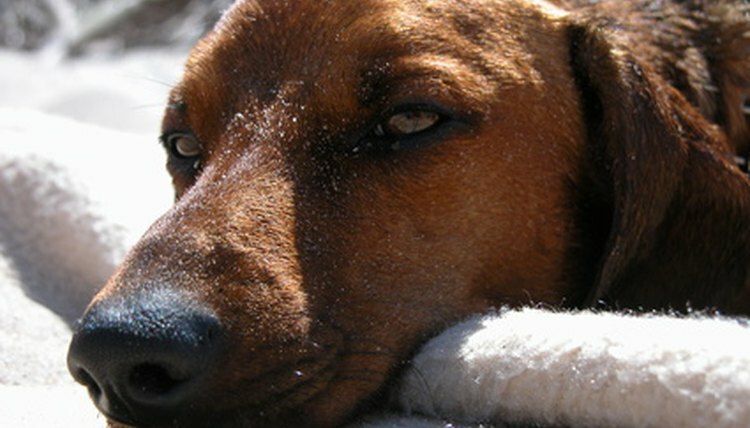 When your dog’s stomach is upset, it can result in diarrhea. This is not only irritating to his digestive tract, but it also can lead to dehydration and other health issues if not resolved quickly. Generally, you can remedy this ailment by changing your dog’s diet to include bland foods. Foods free of added seasonings and spices will help soothe your dog's stomach. In addition, you can add a fiber-rich food in moderation to help increase bulk in stools. Your dog should feel better after you've fed him a simple diet for a few days. Stop feeding your pet his regular food and replace it with a bland diet of meat and rice. His current food may be too rich for his weak stomach and may be contributing to the diarrhea. Boil ground beef until it's no longer pink. Drain and let cool. Do not fry or cook the meat using added oil or seasonings. Boiling helps remove fat. It’s important to avoid feeding your dog foods high in fat when his stomach is upset. Cook rice according to package directions. Do not add seasonings or any other ingredients. Let cool. Mix the beef with the rice and place in the dog’s bowl. It can be warm but not too hot. Add ¼ cup of canned pumpkin to the beef and rice mixture. Pumpkin is high in fiber, and will help bind your dog's stool. It’s important that pumpkin is the only ingredient listed on the can. Added sugar or other fillers can worsen diarrhea. Feed this to your dog for each meal for 24 hours. During that time, watch your dog for improvements in his elimination habits. When you’re certain your dog’s stools have returned to normal, return to feeding him his usual diet. You can substitute cooked chicken breast for the boiled ground beef, as it's low in fat. You can also substitute cooked sweet potato for the pumpkin. You can add plain yogurt to this mixture in small amounts (1 tablespoon) to help increase the “good” intestinal bacteria and help return balance to your dog’s digestive tract. Monitor your dog for other symptoms, such as vomiting, lethargy or bloody stools, which could indicate a more serious health problem. If your dog has loose stools for more than two days, consult your veterinarian.